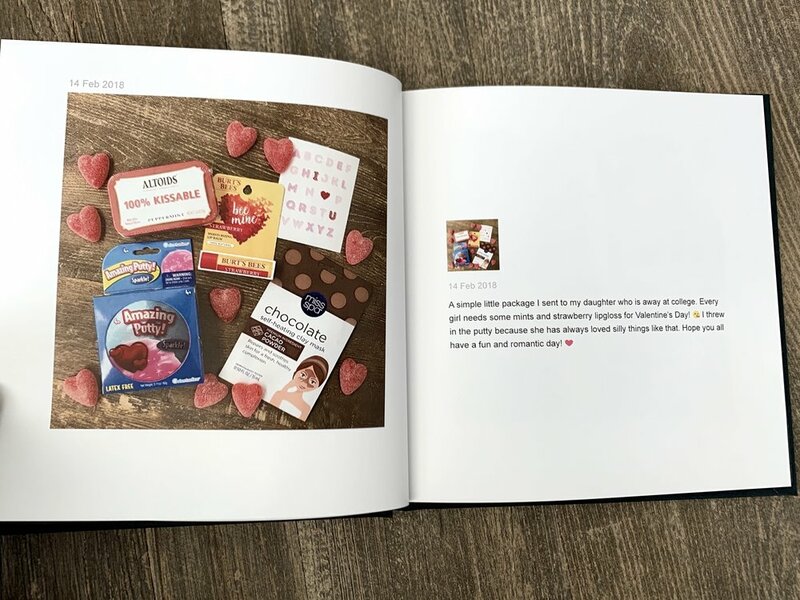 There are other ways to create Chatbooks besides just connecting the service to your Instagram feed, but I’m not going to focus on those. For me, the quality of Chatbook printing is not high enough to use for a main photobook. I’m going to stick with AdoramaPix for those because I love the thick lay-flat pages. It’s worth noting here that Chatbooks is not trying to compete with that. They fill a need for inexpensive and super easy books that almost put themselves together. Such a great idea! This is the option I chose for all the photos in my Katie the Creative Lady Instagram account. I had more than 1,000 posts to print and I used almost all of them. It is easy to edit out the ones you don’t want to use so I deleted all my business related posts announcing sales and such. I wish I had edited out my scrapbook page layouts because they just printed up too small to be useful. I should have anticipated that, but oh well, no biggie. I’ll just do that for future books. I printed up all of these at the same time and now I can just keep up with each book once I have 60 new photos posted. Pretty cool! I chose the Rifle Paper Co. Hardback covers and they are just gorgeous! I love the colors and designs so much. Here are a few peeks at what the pages look like inside. When you have a long description, it wraps over to the next page. If you have a photo only (from multiple photo posts) or a very short journal entry, it will all fit on one page. I did learn that I don’t want to use a lot of hashtags in my main description area because they will take up a lot of space in these books. I will just add those in the comments from now on if I have a lot of them to include. It’s a very simple approach to memory keeping, but that’s what makes it so wonderful. Easy! I love having something tangible on my office bookshelves to represent the many hours of effort I have put into my Instagram feed. Hooray for Chatbooks!